need a computer, not a cell phone to see everything. ground level video as well as drone footage. If you want to know a “buy it now” price, call us at (954) 873-6495…we will tell you that in the 1st 10 seconds. However, we will not respond to text messages or e-mails asking us for that info…we want to hear a real live voice. Make a list of your questions….we will answer them all and do so honestly. If we don’t know the answer, we will tell you so and find out the answers. Eck Motors who had special ordered this car for the 1st owners, Mr. and Mrs. Lutter. If this is of no interest to you, scroll down to the bold red letters dealing with this car’s condition today! honk 3 times and I’ll wave back. on the car in less than a minute after the convertible top was automatically stored in the trunk. stuck out enough to prevent installing fender skirts. The spare appears to be the original Goodyear tire. 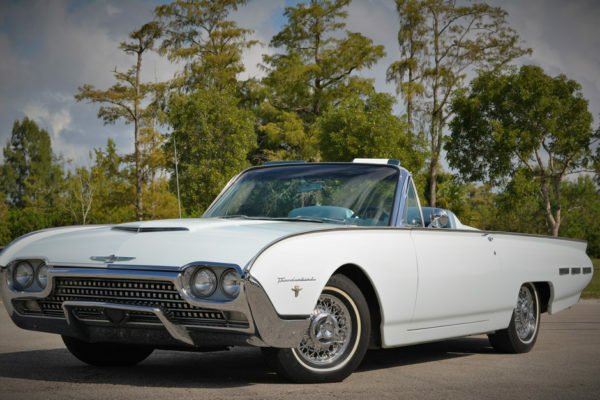 All of these 1st 465 cars had 85 as the 2nd & 3 serial numbers which were same as the regular convertibles. 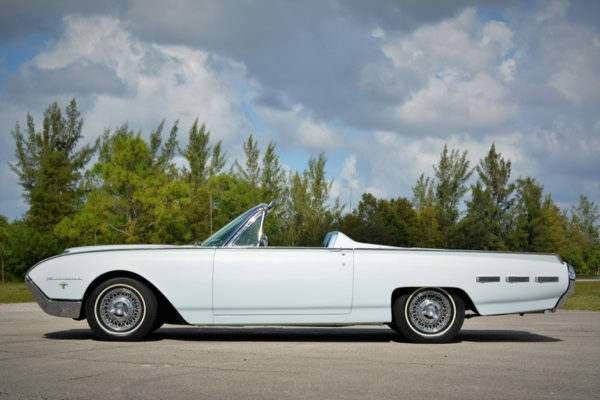 cars while all Factory Roadsters built at Ford were assigned 89 as the 2nd & 3 digits in the serial numbers. The knowledge I learned from these 3 wonderful people is indeed most valuable. 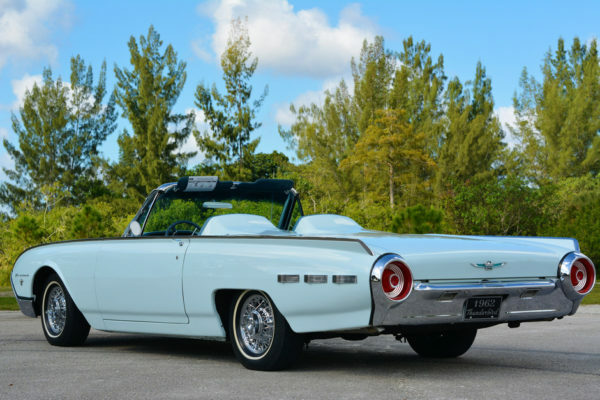 which translates between 285 to 356 Factory built 1962 Ford Sport Roadsters still exist. How many in this condition? Garage Memories has been buying, selling, trading and collecting cars since 1960. Ultra high definition special drones we use to create a 2-3 minute video professional presentation. You will see why we “Never make a sale”…a sale is a one time event! Instead we want to make you a “CUSTOMER” because a customer is forever. What kind of paperwork & documentation will prove the authenticity of a real factory roadster. 2. The factory ORIGINAL build sheets (each car had 2, both usually under the seats. 3. The ORIGINAL factory gate release, showing the date the car was shipped and to what dealer. all 3, including the books, manuals and photos of the restoration. Only 6 Roadster are believed to have been built in this color combination in 1962. We only know of the existence of one remaining….this car! Now….let me share my 1st hand knowledge of this car. in the AM and has a time stamp indicating it was shipped April 19th, 1962 to The Eck Motor Company in Haven, Kansas. The Trim Tag was the last thing put on these cars, thus the DATE of 19D= April 19th. 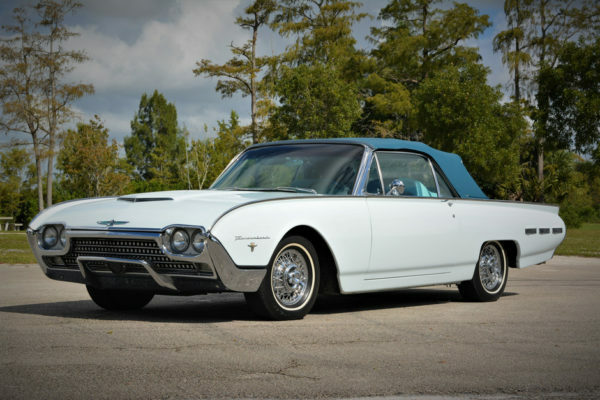 as well as their beautiful Thunderbird in their large backyard showing off how the convertible top retracts into the trunk. $118.50 for transportation and $5.00 for Gas & Antifreeze….man…those were the days…yes I remember paying 18.9 cents a gallon for hi-test. by Fred Alonzo on the 10th of November, 1975. A newspaper article (no date) states that a Ron Tussey took 1st Place in post war sports cars through the 1960’s in the Easter Classic. The story appeared in the Globe-Democrat. receiving an award as “State Champion ” in his class. Other photos show this car at the Thunderbird Nationals and a large table loaded with trophies. There are several more very sharp & clear photos of this car inside of a garage devoted solely to this car. received this restoration within the past year. 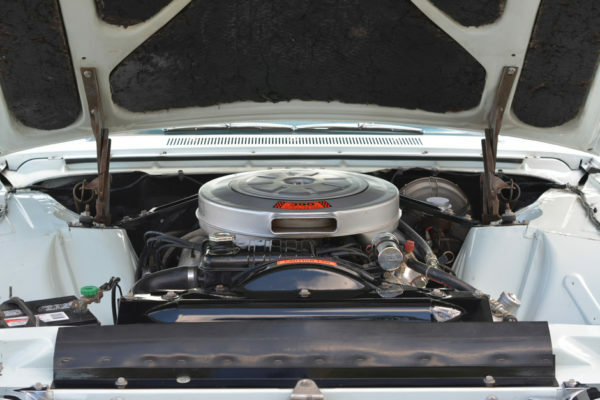 There are photos of the engine & transmission out of the car….and the car in various stages of restoration. I can tell by the way this car starts, idles, accelerates, shifts and stops that it was done to perfection. The cost to do a rotisserie restoration on this car today, if no body work is required, exceeds $100,000 and will take between 1-2 years. license plate that reads 62 TBIRD. The photos are time stamped 9 ’99.We have a newspaper article dated Sunday, May 18th, 2003. City, Florida & Kathy is waiting for her husband, Michael. copy of the Florida title on this car issued on October 8th, 2000. It states on that date this car had verified mileage of 53, 171 miles and states on the title as ACTUAL. I am very pleased that this car has not be parked in a garage or warehouse since making it’s way to South Florida. It has been driven approx. 13,400 miles over the past 19 years for an average of 700 miles a year. This is a car that you can drive several hundred miles to an AACA judging meet or other top car show. Wipe the car down and your ready to take home the 1st Place award. Spend a day…or a week and enjoy the ride back home. 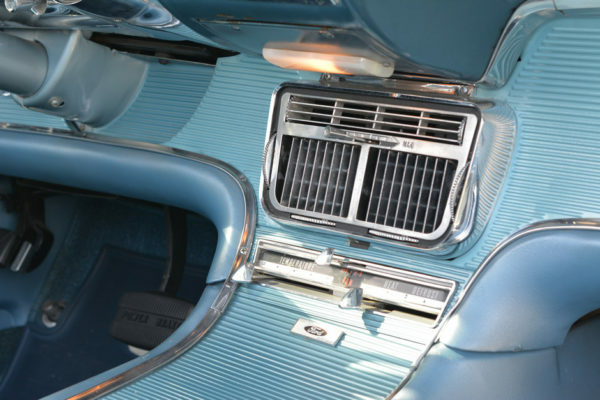 We checked everything on this car and found two things that do not work…the clock & AM radio. Regarding the original AM radio…there isn’t much to listen to on the AM band today. We have been dealing with the same stereo shop in Pompano Beach, FL. for almost 20 years. They radio is custom mounted in it’s own enclosure and can be accomplished without drilling any holes. will send you photos showing the system playing in your car….he takes most any credit card. If you prefer to have your own shop do the installation…all the better. and can also turn on the interior courtesy lamp. 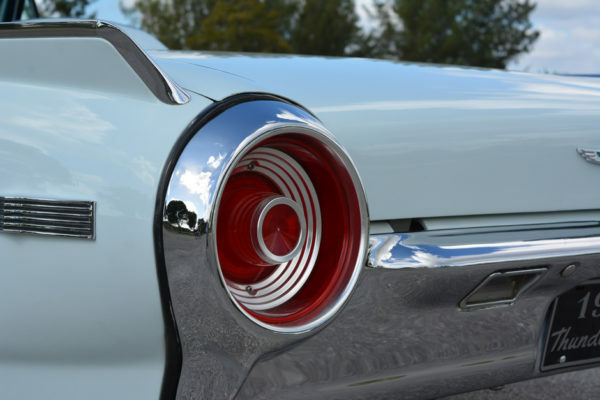 When was the last time you bought a car that will be 57 years old that everything worked and you were NOT disappointed? Ready for some positive pluses on this car? 1. The generator has been upgraded to a new modern alternator. turns on a very efficient cooling fan. 3. The AC has been converted to the atmosphere friendly R34a. 4. The AC compressor is a new, modern & efficient one that will last for years to come. 5. The 4 tires on the car are Michelins and look and ride as new. not the cheap Chinese reproduction ones which sell for $1200 a set. 8. The Tonneau cover is the real deal…not one of the cheap reproduction ones on the market. if you so inclined, you could drive you spectacular Ford Factory Roadster back home. is concealed. I’ll bet you can’t find it either so open the center console and save yourself the trouble of trying to find it. If you can find it on your own….you a better man…or woman than anyone at Garage Memories….LOL. If you prefer, we have been shipping our cars for more than 14 years with Mary Olson of Crossroads Transport. than 1500 cars for us and 1000’s of cars more for several of my car pals who also have their own car museums. This car comes with two sets of keys. Slide the ignition key in, depress the gas pedal 1/2 to the floor and this will activate the choke mechanism. seem to not be running…but it is. your only turning approx. 2500 RPMS at 75mph. as it takes steady & strong voltage to operate the top…another reason why the alternator makes so much sense. We have owned more than 50 Roadsters from 1962 & 1963 but none that looked and drove like this car. wheel which is most unusual in any car 50+ years old. The brakes work great with no pulling to the right or left. How is the Chrome & the pot metal? and has much better vision. What about the paint? Does it look as good in person as it does in the photos & video? We have found a few tiny chips that you can see as the top opens & closes. We will show them up close and I’ll hold a pen next to them so you can get an idea of their size. I would NOT take this car anywhere near a paint and body shop. This car is ready to show…and to win. of $45 (approx. 1/2 of a pint) It’s Ford factory name is Platinum but the retail brochure calls it Diamond Blue. How does the interior look and feel? However, most like the incredible look of the sporty 2 seater. 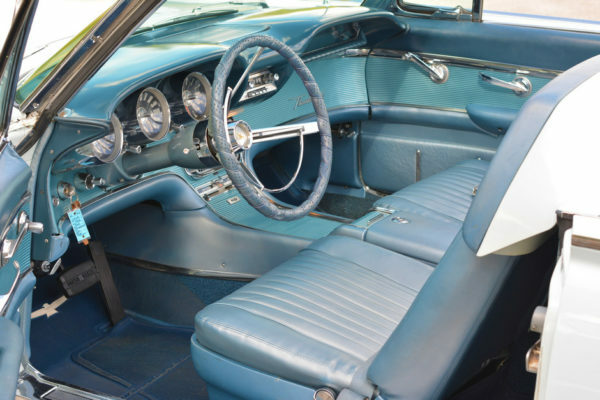 Look at all the aluminum on the center console and on the dash…it’s flawless…no visible scratches…none. The gauges and speedometer and clock are crystal clear. Premium fuel in this car…it will perform fine on both leaded or unleaded. Study all the high resolution photos…it looks just as good in person. Please read: We temporarily installed this small battery…it is of course incorrect. did back in 1962. No points will be deducted at ANY judging event with this battery. In fact it’s a plus. They cost $260.00 plus shipping. We expect it to arrive in 10-14 days as we ordered it two weeks ago. would typically see at one of the MAJOR TOP auctions and we although we feel it might set a record price…. We really “Love the cars….more than the money and we prefer to know who ends up with a Garage Memory car. from the steering wheel…… Should you choose to remove the wrap, it will take less than 5 minutes.